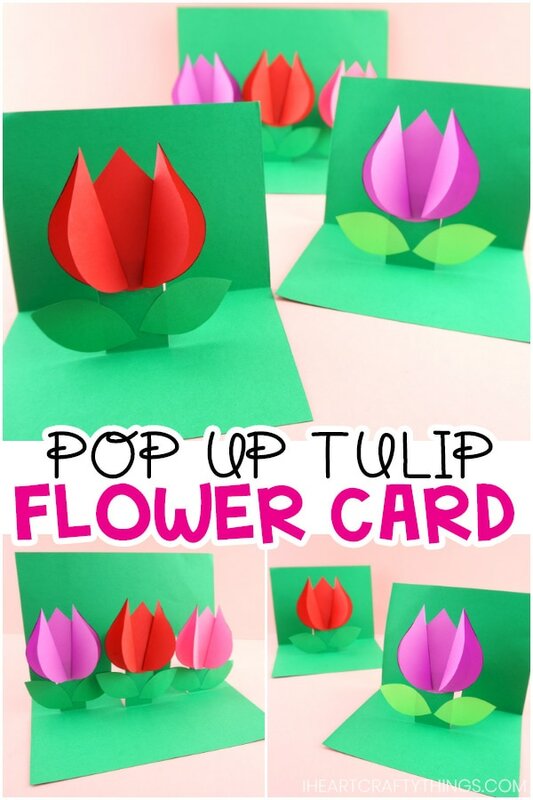 How to Make a Pop Up Flower Card - Easy Spring Tulip Craft for kids! 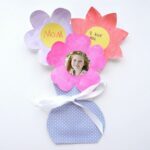 When I was a kid I adored making pop up cards for my mom, especially for holidays like Valentine’s Day or Mother’s Day. This gorgeous pop up flower card we are sharing today is super easy for kids to make and it will bring a full smile to whomever opens it. Once you learn the simple technique of how to make a pop up card, you are sure to be addicted. 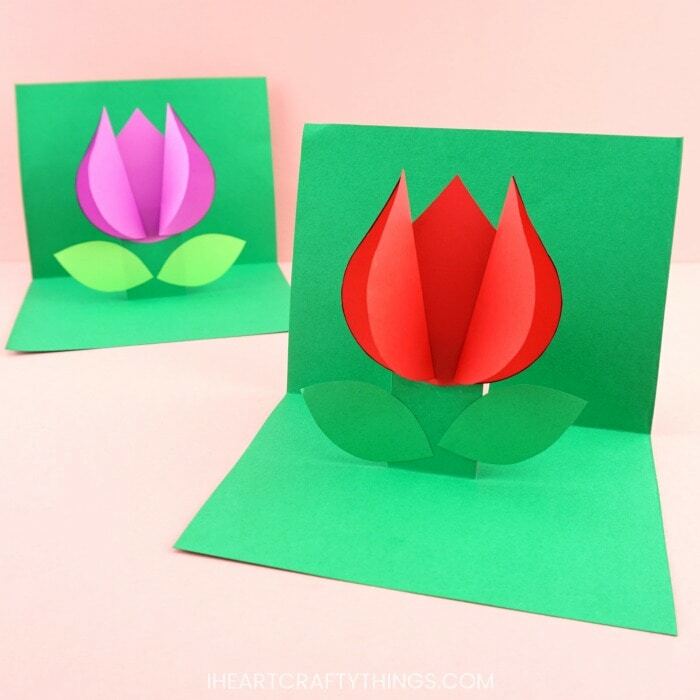 The colorful tulip flowers we added inside this card makes it perfect for kids to make for a spring craft or after visiting a tulip festival in the spring. 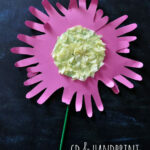 You only need three simple materials to make this easy flower card…paper, scissors and glue. That makes it a fabulous last minute craft idea for kids of all ages to create. 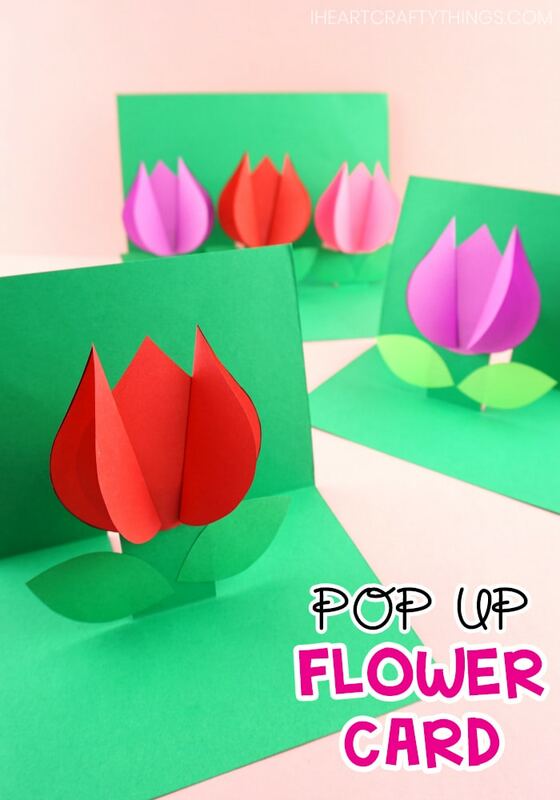 Read through these easy step by instructions below and get ready to make this gorgeous pop up flower card today! Make sure to watch the video tutorial at the bottom of this post of us making this craft. Step 1: Begin by folding your green card stock paper in half width-wise. Open it up and cut it in half along the folded crease. 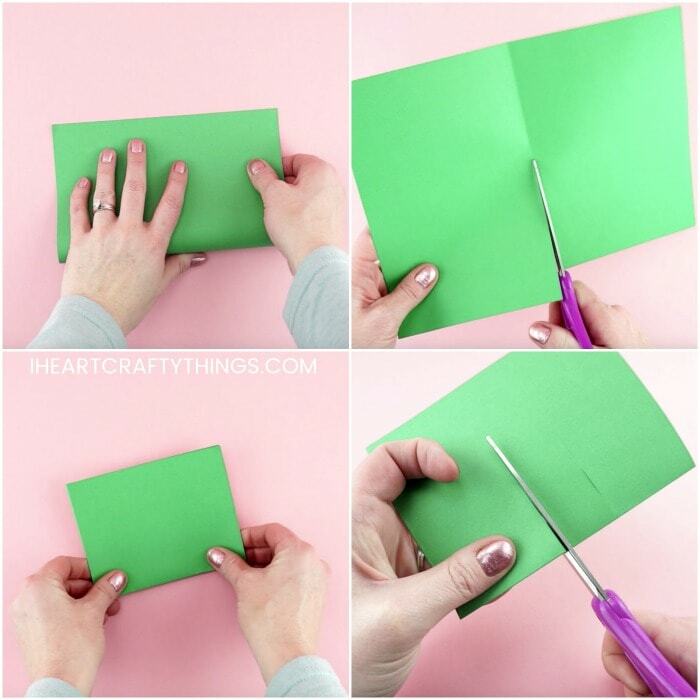 Fold the half sheet of cardstock in half again length-wise to create your card. Optional: To make a larger card, simple fold your 8.5 x 11-inch cardstock in half width-wise to use for your card. Step 2: Use scissors to cut two slits in the middle of the folded side of the card 1-inch apart from each other. Make each of the slits about 2-inches in length. Step 3: Fold down and crease the section in the middle of the card that was created by cutting the slits. Step 4: Carefully open up the green cardstock again. Invert the section of paper you just folded down and close your card again along the crease. When you open up the card, the inverted section should stand upright in the crease of the card making the pop out for your tulip flower. 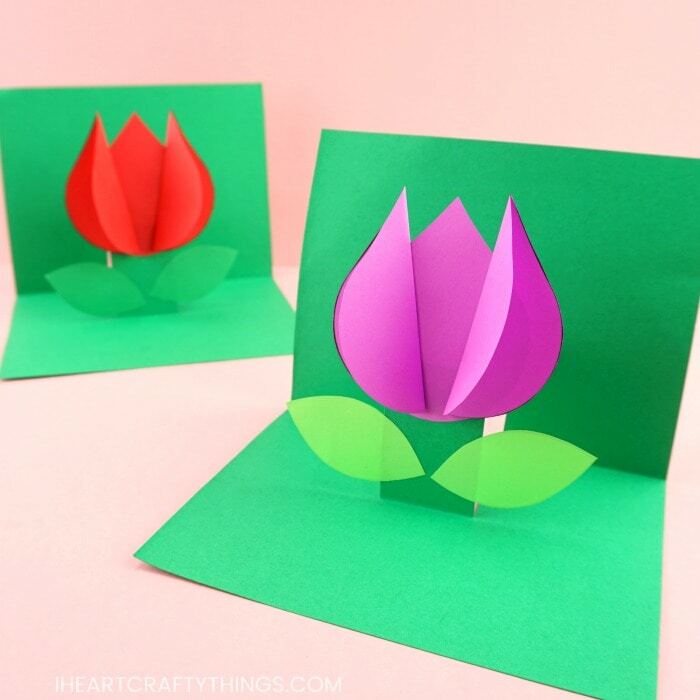 Option: If you chose to make a larger card for more than one flower, you will need to cut two slits for each flower you include. See the photo above as an example. Step 5: Download the tulip flower template. The flower petals page of the template makes three pop up flowers. You’ll need three of the flower petal pieces per flower. The leaves page of the template includes enough leaves for 6 flowers. You’ll need two leaves per flower. 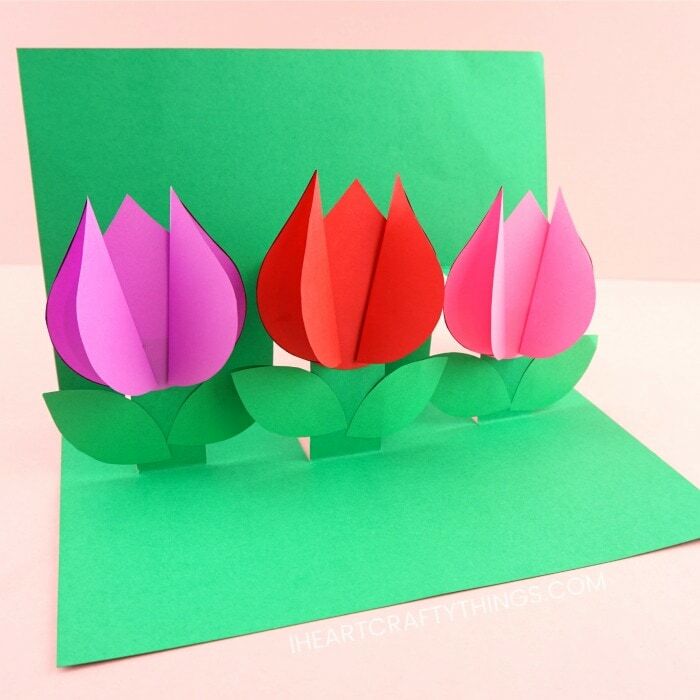 Print the leaves page on green cardstock and print the tulip petals page on red, pink or purple cardstock. 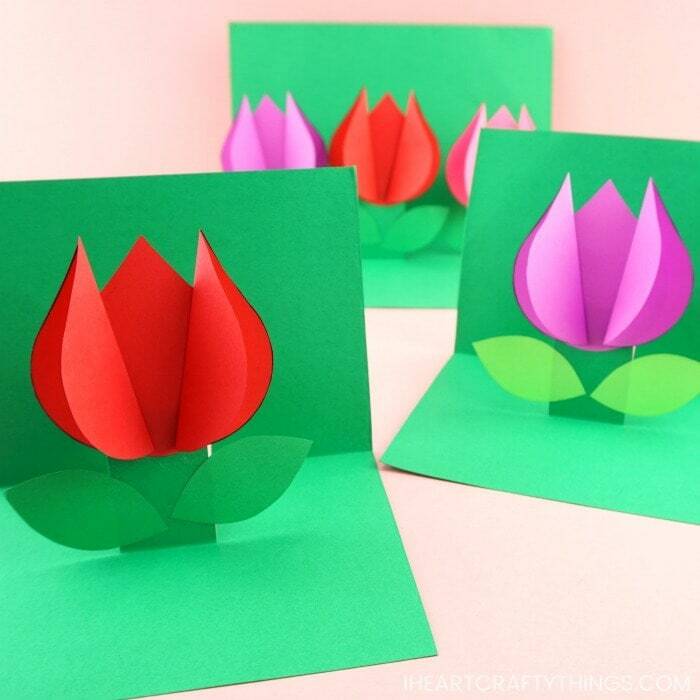 Cut out the flower template pieces for your pop up flower card. Step 6: Fold two of the flower petals in half for each flower. Add glue to the right and left edge of the unfolded flower petal and attach your folded petals to it, with the folded edge of the petal facing inward on both sides. This gives your tulip a 3D flower effect. Step 7: Use a glue stick to add glue at the top of your pop out section on your card. 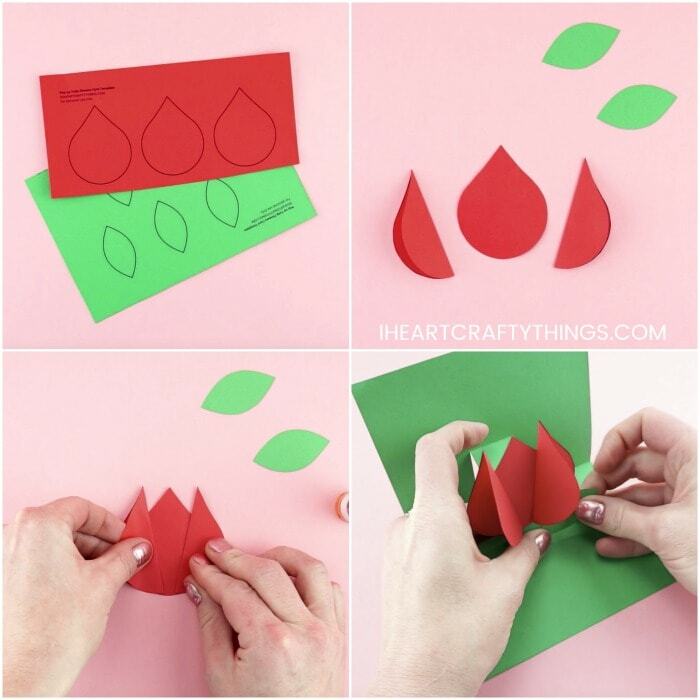 Glue your 3D paper flower onto the pop out. If you are including more than one flower, glue each of the flowers on the pop out section of the card. Step 8: Finish your pop up flower card by gluing two leaves underneath the flowers on the stem. Step 9: If you want to personalize your card for a Mother’s Day card, Valentine’s Day card, or for a simple spring card, use markers to write a message on the bottom of the card. You can get as creative with this card as you choose. You might like to make some additional paper flowers and glue them on the back base of the card. This would make it look like layers of tulips in a garden. We also used a lighter color of leaves for one of our cards to add extra color and dimension to the pop out flower. You can even mix and match different colors of flower petals to make colorful tulips. Feel free to make your card unique and special to you. 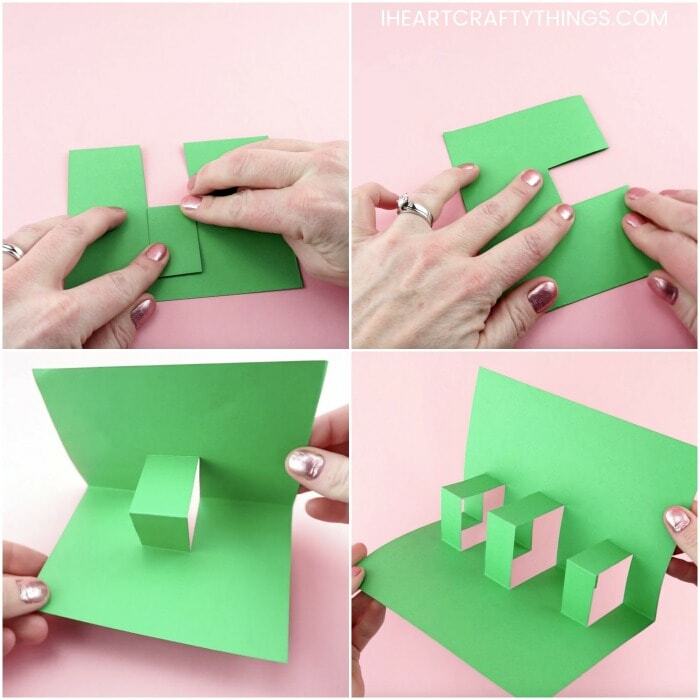 Watch the video below for a step by step guide on how to make this easy spring pop up card. 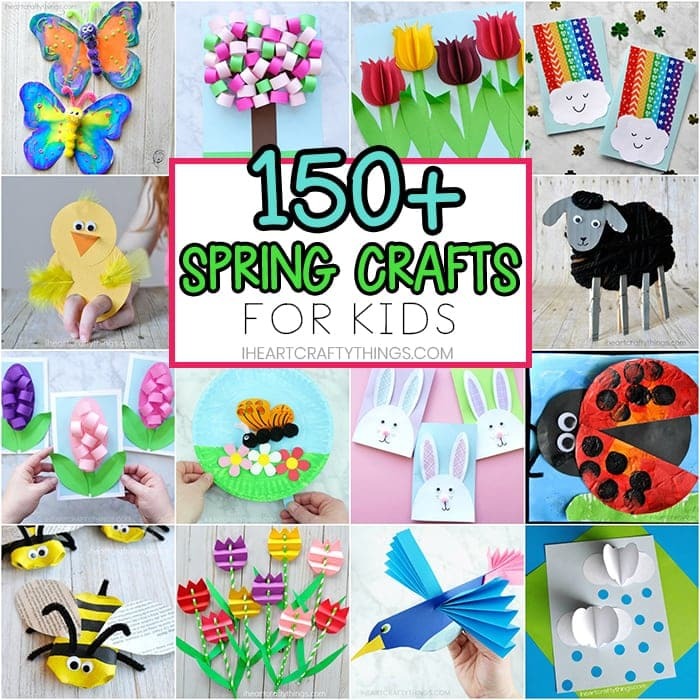 Find more spring crafts and flower craft ideas by browsing the categories at the top menu bar of our website. 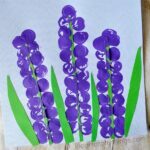 Here are more fun crafts for spring. 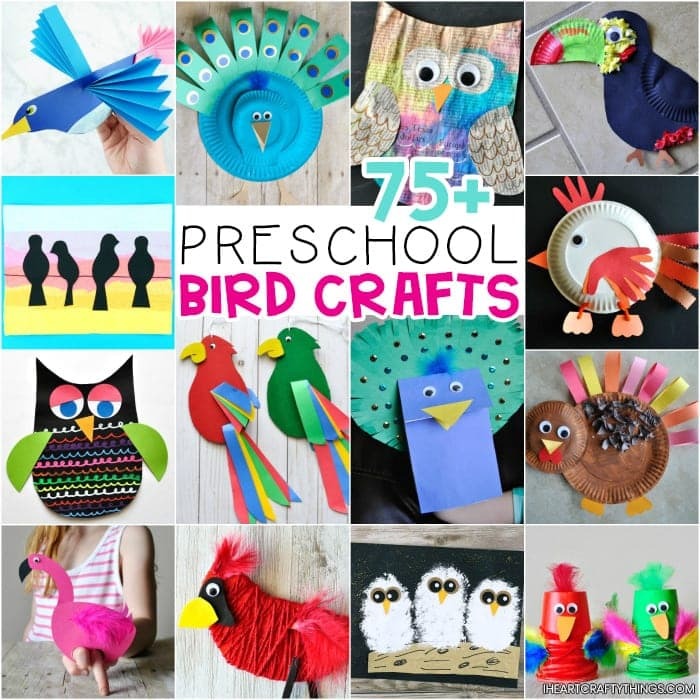 Make some colorful bird crafts to go along with your pop up flower card.